This video demonstrates the new RadTimePicker control as well as several properties you should be aware of. Drag RadTimePicker from the toolbox to the form. Modify the desired minute’s interval by setting the Step property. Set hour format by modifying the Culture property. For example "en-US" uses 12 hour format while “en-GB” uses 24 hour format. 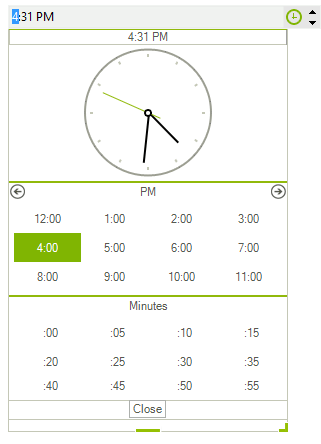 Set the ClockPosition property to ClockAboveTables to display the clock on the top of the popup.